When we exercised the Tark of Dunya (World), we got the Special Faqar then and only then the Course of the extraordinary Faqar opened for us, when we humiliated our Nafs on every next door as a beggar. 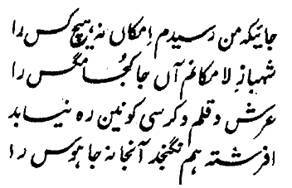 We drunk the whole river of Marifat and Wahdat but our thirst was not quenched. O Bahu Rahmatullah Alaihi ! Faqar is weeping day and night in Ishq and with the tears of Ache and Muhabbat. People think it is like an easy sport and game. There the addicted of the ravenousness can never reach [that is, there the perception and thought of the man cannot even reach]. [Therefore] Marifat has become my assemblage [that is, the Marifat and Faqar have come to end on me]. The Marifat and Faqar have ended on me. His highness narrates the incident of his first appearance in the Hazoor of the overlord of the worlds and the Sayyed of Jinn and Mankind, the Khatam ul Anbiya, the Ahmed e Mujtaba, Hazrat Muhammad Mustafa Sall-Allahu Alaihi Wa Aalihee Wassallam in this way that 'once in my childhood, a handsome Noorani person with dashing personality came riding on a horse before me and held my hand and seated me behind him on the horse. He caused the horse to fly when he gave it a stroke of his heel. I asked that rider that who he was and where he was taking me. He told me that he was (Hazrat) Ali Karam Allah Wajhu and I am going to take you in the Majlis of the Holy Prophet Hazrat Muhammad Mustafa Sall-Allahu Alaihi Wa Aalihee Wassallam as his highness has remembered you.